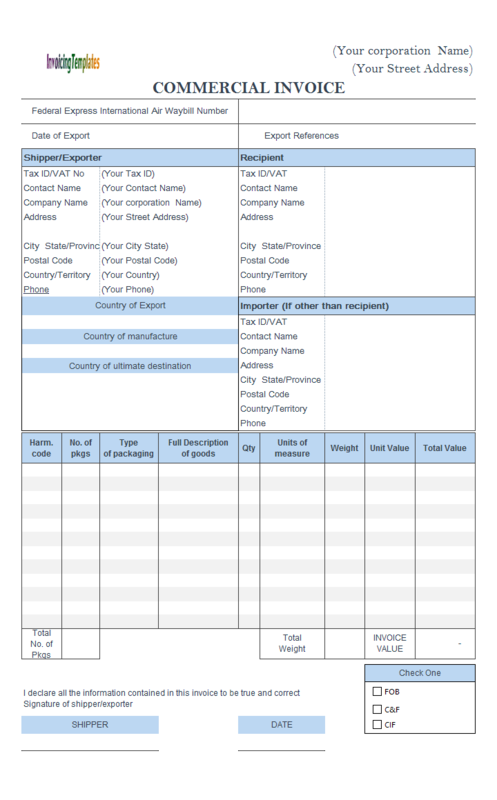 The commercial invoice is required by both the exporter and importer. 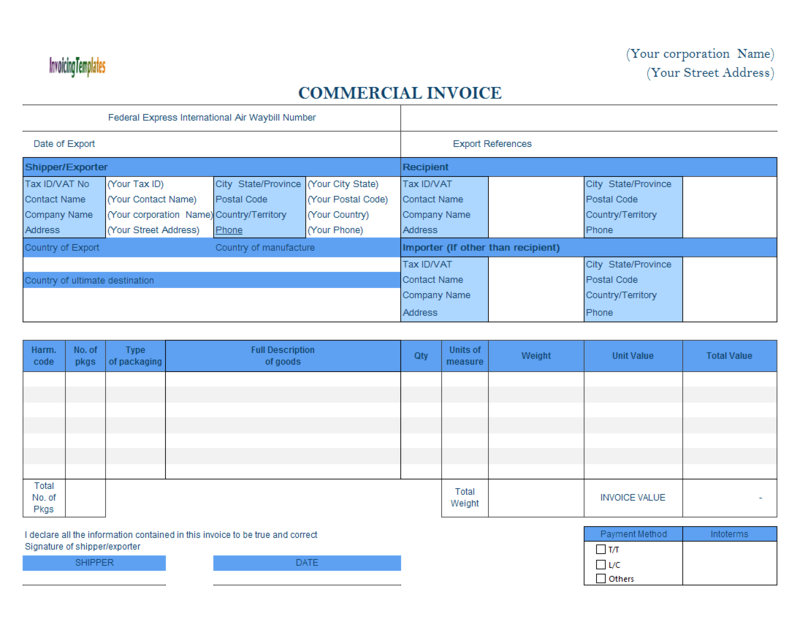 While most logos in our free invoice templates are images, this design of commercial invoice form demonstrates how to create your own logo using Word Art. The approach applies to all our Excel invoice templates. 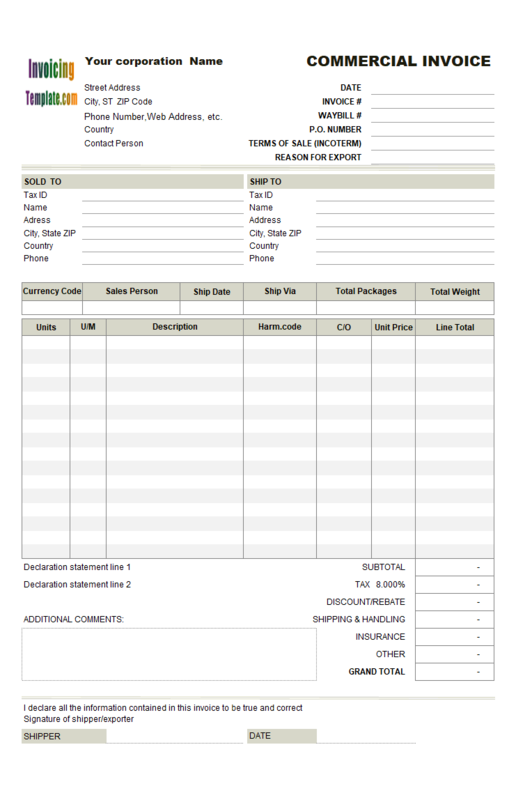 c9007 now includes the customized invoice template for the latest version of Invoice Manager for Excel. This is what you will see when you open commercial-invoice-format-editable-word-art-logo.xlsx. 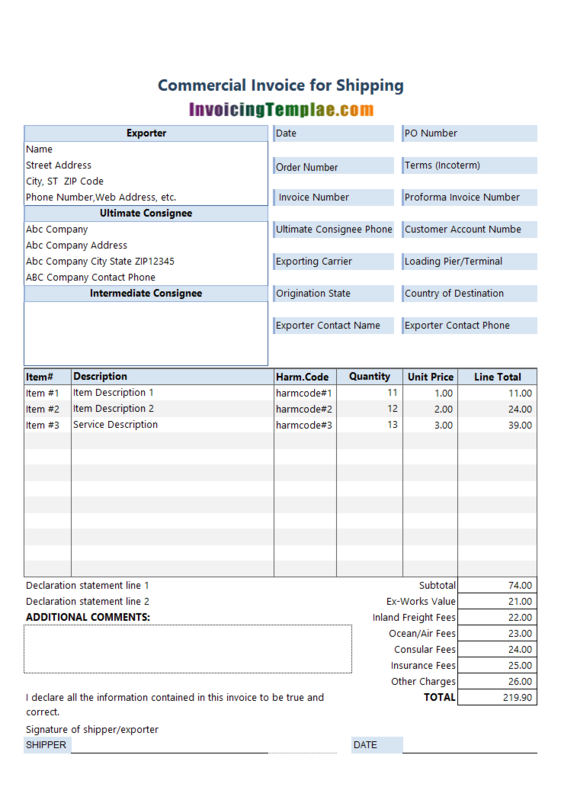 Take a look at the screenshot images of this commercial invoice template, you'll find it contains a similar logo like the other invoice formats here on InvoicingTemplate.com. 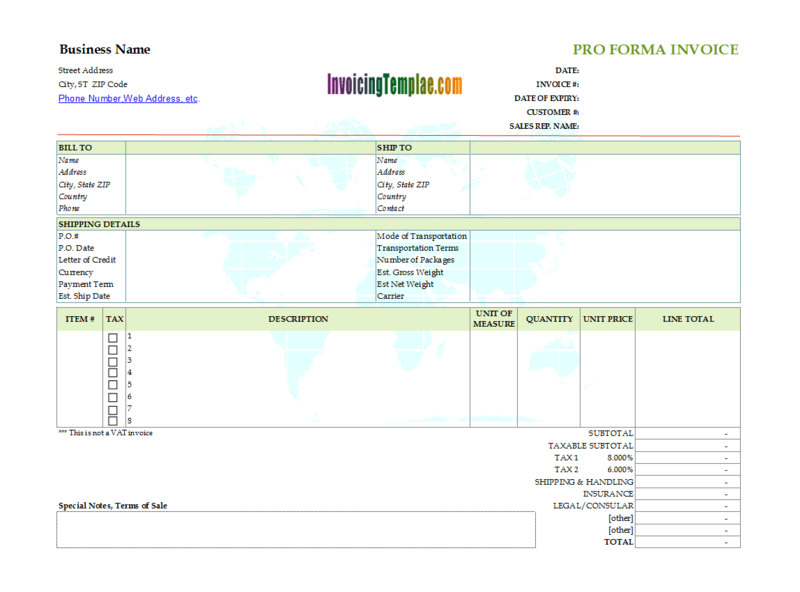 However what the image does not tell you is that it is a Word Art, and it is editable (see feature gallery: editable / customizable invoice templates), which means while the template is in design mode, you can replace the text "InvoicingTemplate.com" with your own business name. You should be aware that the commercial invoice is used by Customs authorities throughout the world for assessing Customs duties, inspection purposes, and for the keeping of statistics. 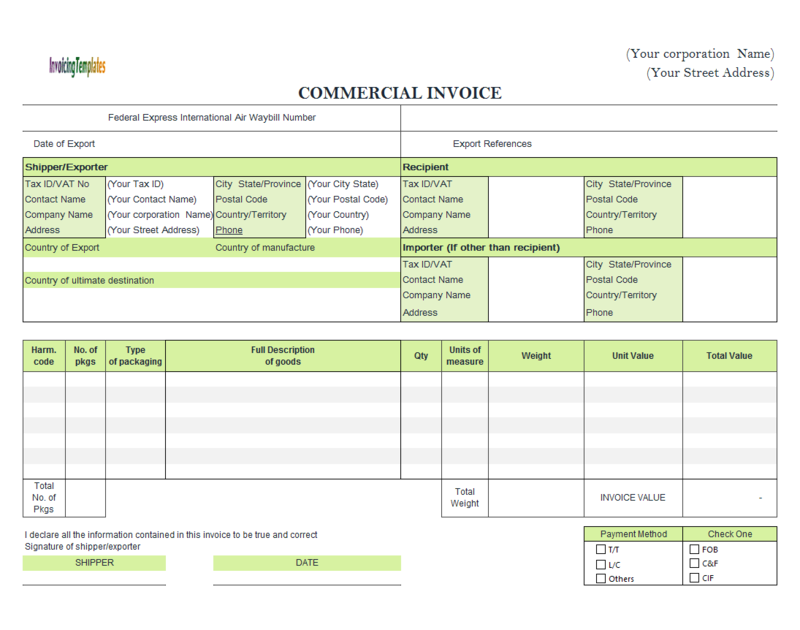 Using a professional logo on your commercial invoices could dramatically improve the look and feel of your documents. What if you are just started your small business, and have no logo yet? You can hire a freelance graphic designer (see invoice templates for freelancers) to do the job, or do it yourself by using tools like Adobe Photoshop. 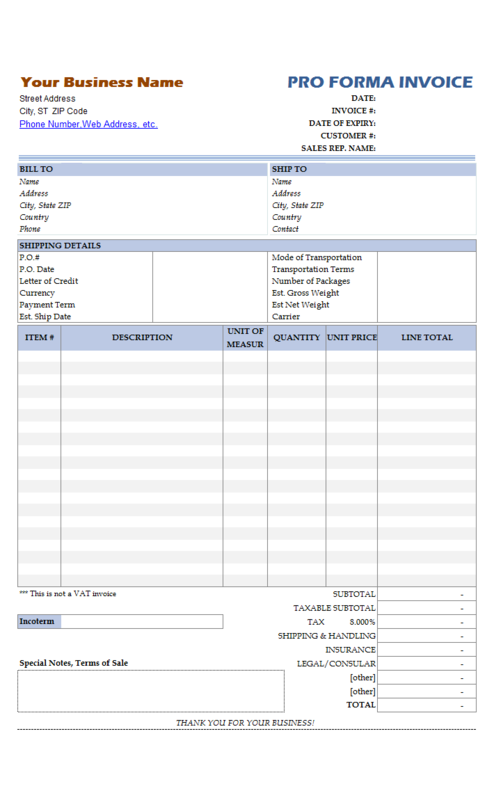 Most invoicing templates available here on InvoicingTemplate.com, which is usually an ActiveX control or an Office form control holding an image - by default, it shows just our web site domain name "InvoicingTemplate" or sometimes "InvoicingTemplate.com". The reason we use that approach is that it is relatively easy for both end-user and Invoice Manager for Excel (namely Uniform Invoice Software) to replace the default image holder with another logo image. 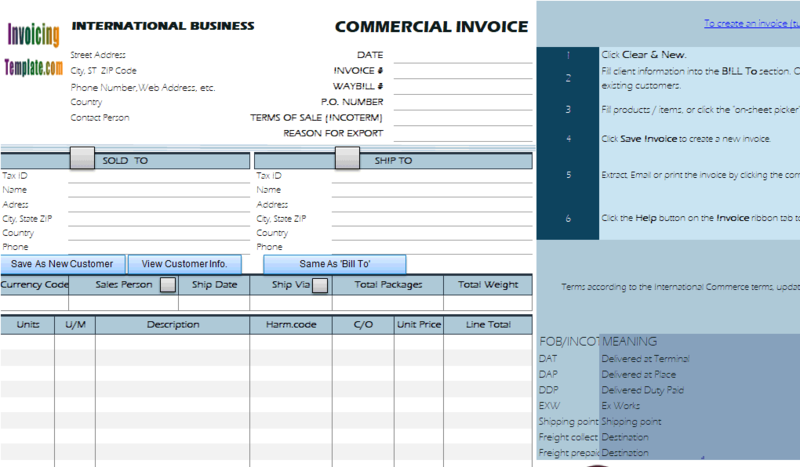 A number of commercial invoice templates available here on InvoicingTemplate.com use that approach too. 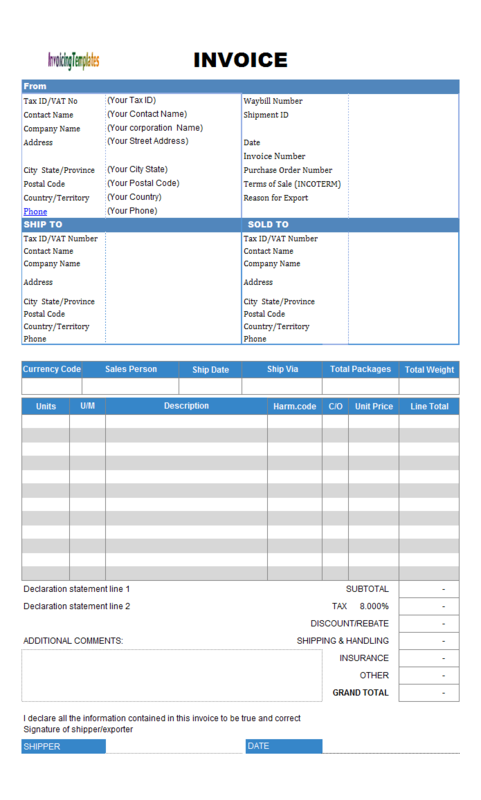 For example, our Basic Commercial Invoicing Template (c7015), Blank Commercial Invoice Template (c7004), Commercial Invoice Template (UPS Style) (c7025), Commercial Invoice - FedEx Style (c9002), Commercial Invoice - FedEx Style (Landscape) (c9003), Commercial Template Sample - Complete Incoterms Option (c9005), etc. However if you are not familiar with Photoshop or other image editing applications, you may find it is not easy and time-consuming to create an ideal logo image for use in your commercial invoices. One possible alternative way is to insert some WordArt as your logo image. WordArt is a gallery of text styles that you can add to your Office documents, including Excel spreadsheets, to create decorative effects, such as shadowed or mirrored (reflected) text. Without requiring image processing skills, WordArt enables you to create eye-catching logos for your businesses. Feel free to take a look at the Office Document: Add, change, or delete WordArt. Microsoft Excel, Word (see Word Invoice Template), Outlook, PowerPoint and Publisher all supports this feature. 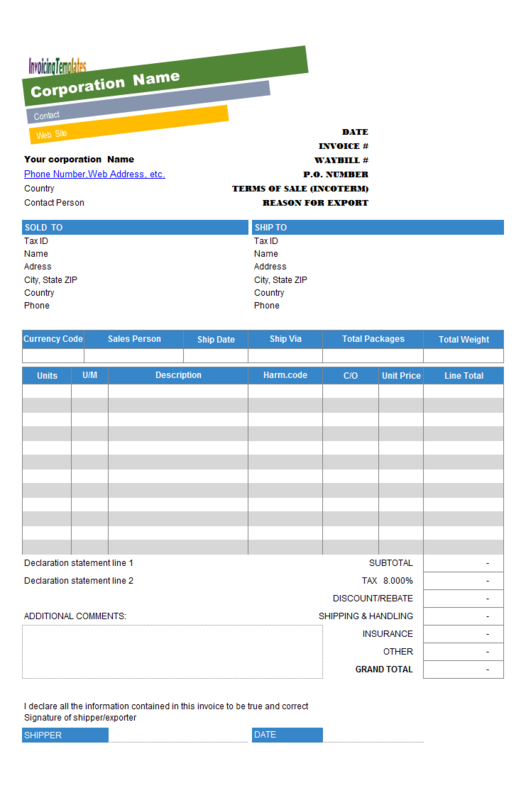 In this commercial invoice template sample, Commercial Invoice Format with Word Art Logo, we first delete the existing ActiveX logo image control from the base template Commercial Template Sample - Complete Incoterms Option (c9005), and then insert a Word Art to create a new text logo. As you'll find from the screenshot images, if you have only limited budget for your logo images, using WordArt to create your logo on commercial invoices could result in ideal effect too. Let's see the brief steps involved to replace the default image-based logo with a WordArt logo. First of all, backup the original commercial invoice template. Click to select the default logo image. Hit DEL on keyboard to delete it. Go to Excel "Insert" ribbon tab. From the "Text" group, Click "WordArt" and then choose one of the WordArt. Type in your business name that you want to appear on the logo. In this sample, we enter the text "InvoicingTemplate.com". Go to Excel "Home" ribbon tab, from "Font" group, choose the font face and size. Make sure the font-size is adjusted to be suitable for inserting the logo image into a blank area (not used area). In this case, we use "Berlin Sans FB Demi" font and font size is set to 28. Resize the text box around the WordArt. Move the box to the location where you want to place the logo image. With the WordArt box selected, name it "oknWidget_logo". Go to the "Drawing Tools / Format" ribbon tab, expand the "WordArt Styles" group to open the "Format Shape" pane. On the "Format Shape" pane, click "Text Options". Choose "Text fill and outline" (The first sub-tab). In the "Text Fill" section, choose "Gradient fill". Set 3 gradient stops here: the left-most stop is set to red, the middle stop is set to green, the right-most stop is set to blue. The final result of the Word Art text logo looks like the image logo that we add to most of our free Excel invoice template samples. The difference is that this word art logo is editable. Click the text area of the logo to put the logo into edit mode, you can then add / edit text. 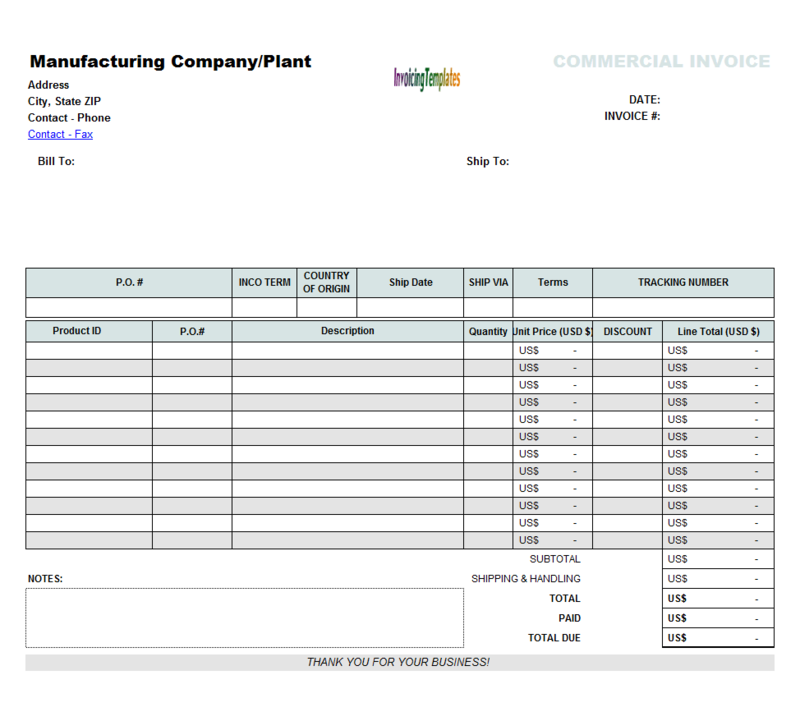 Once you have finished your design, click "Design Mode" button again (on the "Invoice" ribbon tab) to exit design mode. The key behind the success of every business or commercial undertaking is their ability to take note of small details and utilizing them to serve the greater purpose. A beautiful logo image on your commercial invoices is one of those factor that is worth to pay attention to. 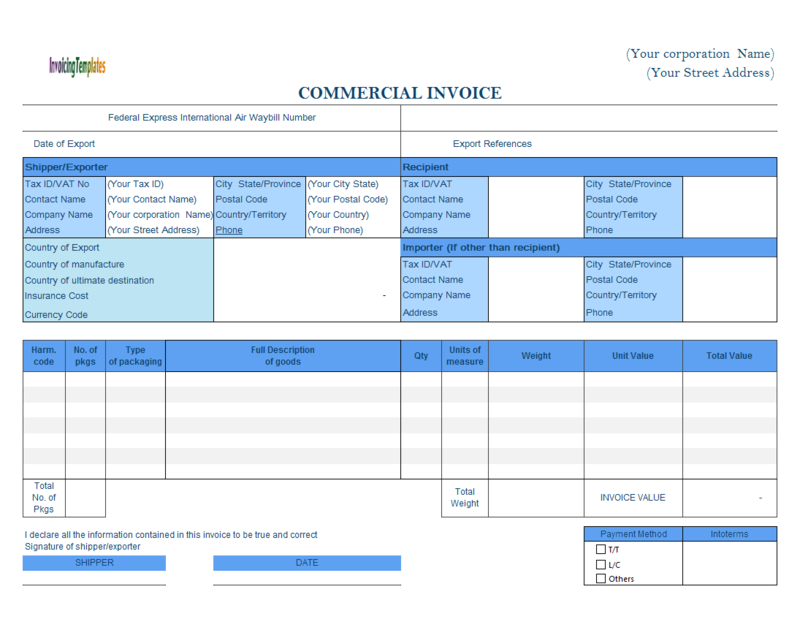 If you don't want a commercial invoice template, but prefer to have a general invoice format with this editable logo Word Art logo, simple open both invoice templates in Excel, and copy / paste it from one template to another. 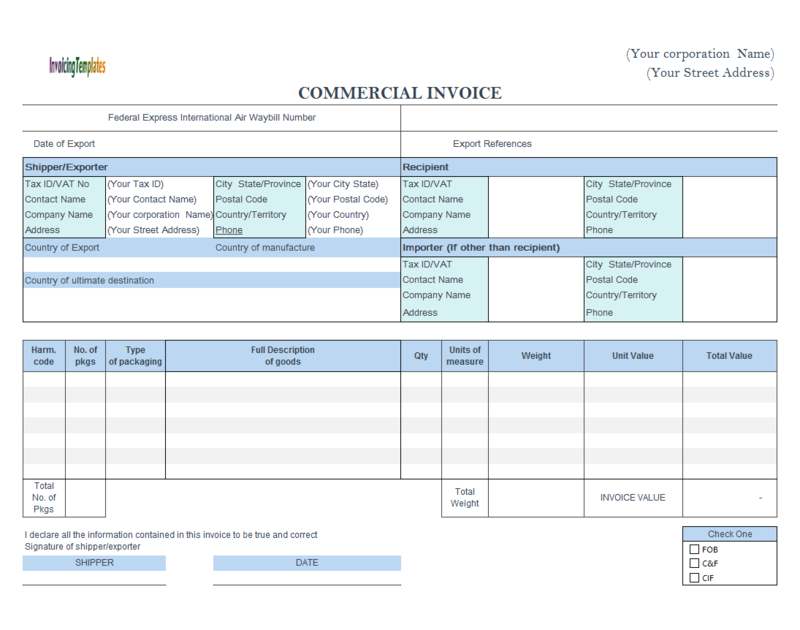 Like other form designs here on InvoicingTemplate.com, Commercial Invoice Template with Word Art Logo is free (offered to you at a price of 0.00USD). It works on Windows XP and all newer versions of Windows, and Excel 2007, 2010, 2013 or 2016.